Riding a bicycle in Miami can be dangerous. But just how dangerous exactly is it? And which neighborhoods are most prone to bicycle crashes? Looking into the Florida Department of Transportation (FDOT) Safety Office’s comprehensive crash data, we extracted the location of bicycle-related crashes. Specifically, we identified crashes involving at least one bicyclist (known, according to FDOT, as a “vulnerable road user”), and at least one motor vehicle. We analyzed the density of crashes from 2005 to 2013, and created nine heat maps (animated below) to illustrate the intensity of the crashes throughout these years. While the FDOT crash datasets are remarkably robust, this initial post on the subject of safety on Miami’s transportation network aims to establish a generalized, county-level assessment of bicycle crash densities. Future posts will analyze these patterns at smaller geographic (larger cartographic) scales. Each crash is represented by a small, dark purple point. As the colors surrounding the crash points change, so change the density of the crashes. Densities increase as the colors change from cool to warm. The color ramps associated with each year of crash data — the ‘heat’ of the maps, if you will — are relative to the density of crashes for each year, exclusive of the crash density for previous or later years. In other words, the ‘heat’ depicted in each map is quantitatively and cartographically unrelated to that depicted in the other maps. Miami-Dade Bicycle Crashes, 2005. Data Source: FDOT Safety Office. Map Source: Sebastien Lozano & Matthew Toro. 2015. 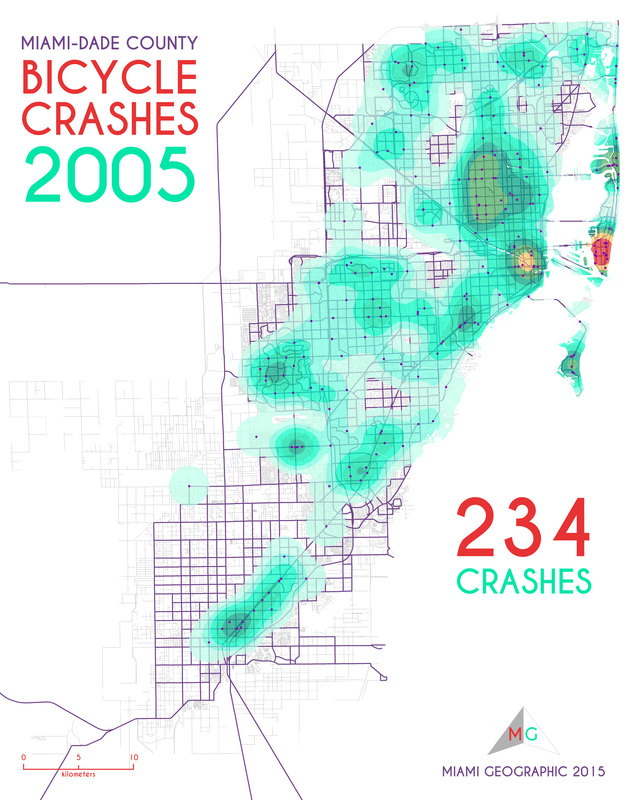 Miami-Dade Bicycle Crashes, 2006. Data Source: FDOT Safety Office. Map Source: Sebastien Lozano & Matthew Toro. 2015. 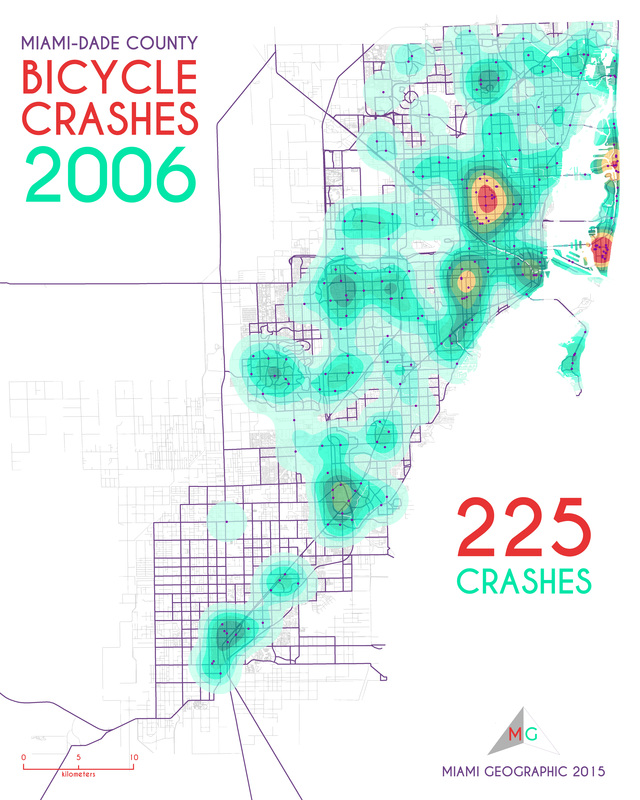 Miami-Dade Bicycle Crashes, 2007. Data Source: FDOT Safety Office. Map Source: Sebastien Lozano & Matthew Toro. 2015. 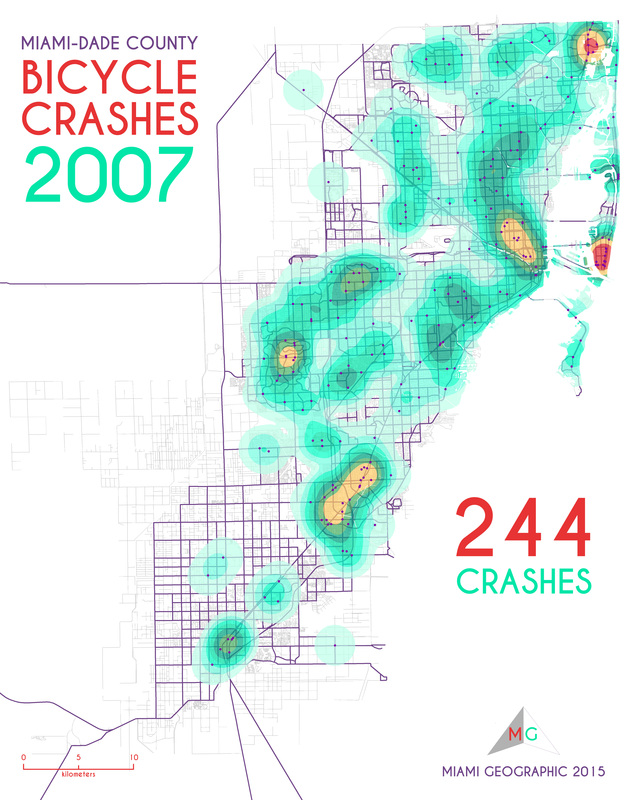 Miami-Dade Bicycle Crashes, 2008. Data Source: FDOT Safety Office. Map Source: Sebastien Lozano & Matthew Toro. 2015. 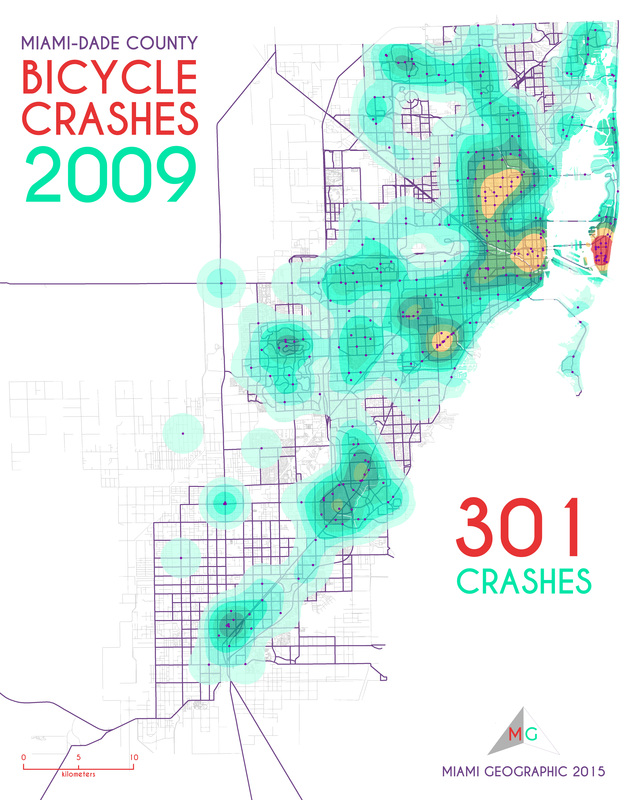 Miami-Dade Bicycle Crashes, 2009. Data Source: FDOT Safety Office. Map Source: Sebastien Lozano & Matthew Toro. 2015. 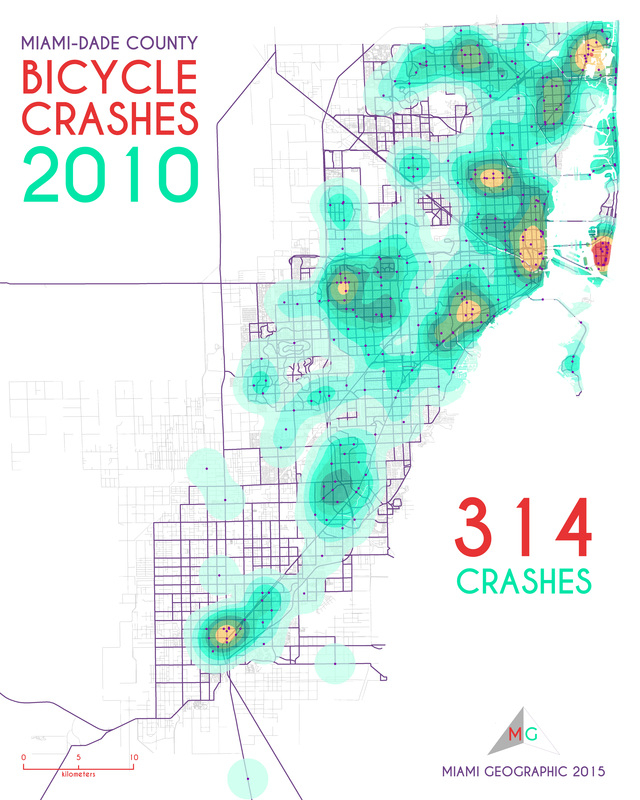 Miami-Dade Bicycle Crashes, 2010. Data Source: FDOT Safety Office. Map Source: Sebastien Lozano & Matthew Toro. 2015. Miami-Dade Bicycle Crashes, 2011. Data Source: FDOT Safety Office. Map Source: Sebastien Lozano & Matthew Toro. 2015. Miami-Dade Bicycle Crashes, 2012. Data Source: FDOT Safety Office. Map Source: Sebastien Lozano & Matthew Toro. 2015. 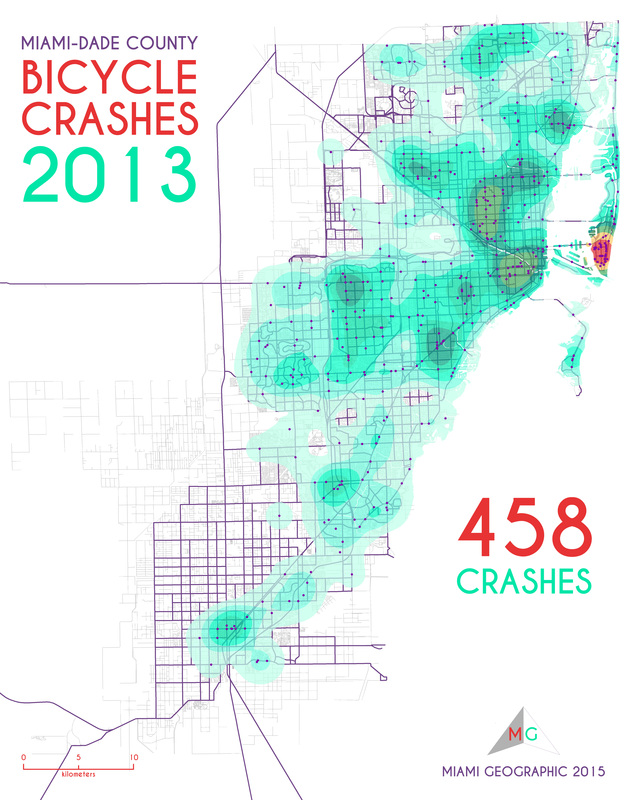 Miami-Dade Bicycle Crashes, 2013. Data Source: FDOT Safety Office. Map Source: Sebastien Lozano & Matthew Toro. 2015. With regard to the specific neighborhoods most affected by automobile-on-bicycle collisions, one area in particular stands-out as a constant hot spot during the nine year period. Miami Beach is where crashes are overwhelmingly densest. The central and southern parts of Coral Gables, near the University of Miami, as well as the City of Miami proper, also experience consistently high crashes levels. Neighborhoods such as Little Havana, Brownsville, Overtown, and central downtown have relatively high crash counts and density levels. On the other hand, some neighborhoods experience relatively fewer crashes. The relationship between neighborhood population density and bicycle crash density is apparent. 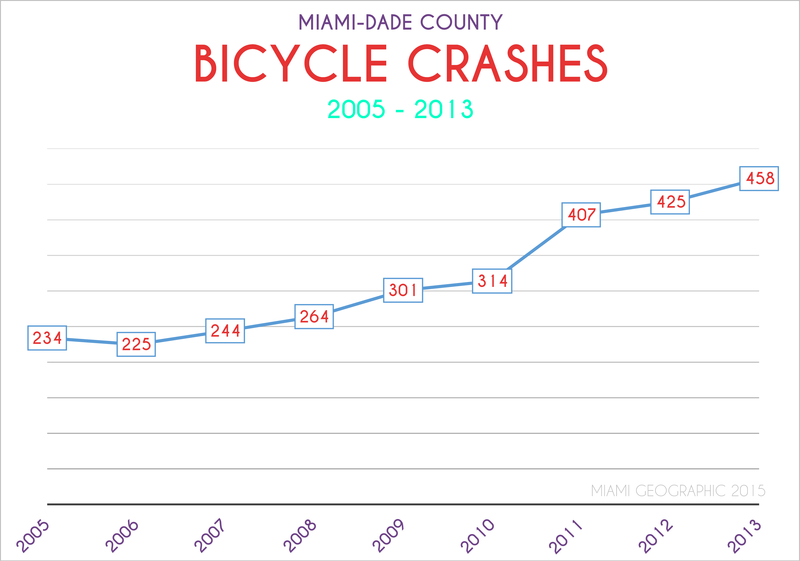 Miami-Dade County Bicycle Crashes — Line Graph, 2005-2013. Data Source: FDOT Safety Office. Graph Source: Sebastien Lozano & Matthew Toro. 2015. Does this mean it’s becoming even more dangerous to ride a bike in Miami? Not necessarily. That conclusion can’t be made with crash data alone. What’s more important is the ratio of bike crashes to overall bike ridership. It’s plausible that the near doubling of crashes from 2005 to 2013 is due simply to more Miamians taking to the streets on their own two pedal-powered wheels. Without question, the cycling culture in Miami has grown in the last several years, as exemplified by the explosion in popularity of Miami’s monthly Critical Mass event. It’s difficult to quantify just how large the increase in Miami bike ridership has been, though. The city did at least come in at #28 on the list of the 70 largest cities with the highest share of bicycle commuters in the “Where We Ride: Analysis of Cycling in American Cities” report published by The League of American Cyclists. Shabby? Yes; but not too shabby . . . Miami’s at least in the upper half of the list. That same report also listed Miami among the top 50 cities where bicycle commuting is growing the fastest, citing an increase in bicycle ridership of 64.2%, from 0.6% in 1990 to 1.0% in 2012. In any case, the methodological problem stands: no concrete data exists on Miami’s overall bicycle ridership. There is, of course, the data used by The League of American Cyclists in that “Where We Ride” report mentioned above. They used the US Census Bureau’s American Community Survey (ACS) datasets on Means of Transportation to Work, which obviously include bicycle transportation. Cycling for transportation, though, is an overly specific mode of cycling which, by its very definition, excludes riding for other reasons, such as for simple urban exploration, or for the sheer bliss and freedom of cycling purely for the sake of cycling. The Atlantic’s City Lab recently reported on research published in the academic journal Injury Prevention elaborating the rather obvious reality that, as the total number of bicyclists increase, so too do the total number of accidents. No rocket science there. But that’s not all of it: Researchers also found that, as the percentage of cyclists and pedestrians increased, the corresponding risk of cyclist and pedestrian collisions was not proportional. Taking into account the amount of walking and bicycling, the probability that a motorist will strike an individual person walking or bicycling declines with the roughly −0.6 power of the number of persons walking or bicycling. An individual’s risk while walking in a community with twice as much walking will reduce to 66% (20.4/2 = 2-0.6 = 0.66). So, to break that down a bit: According to these findings, if the people of a particular community — say, Miami — were to increase by 100% their levels of walking and biking, the risk of getting hit by a car would not increase by 100%; it’d increase by only 33%. Perhaps, then, so as to make future versions of Miami’s bicycle crash maps a little less colorful, we need to collectively demand modifications to our built environment that encourage more cycling and walking. 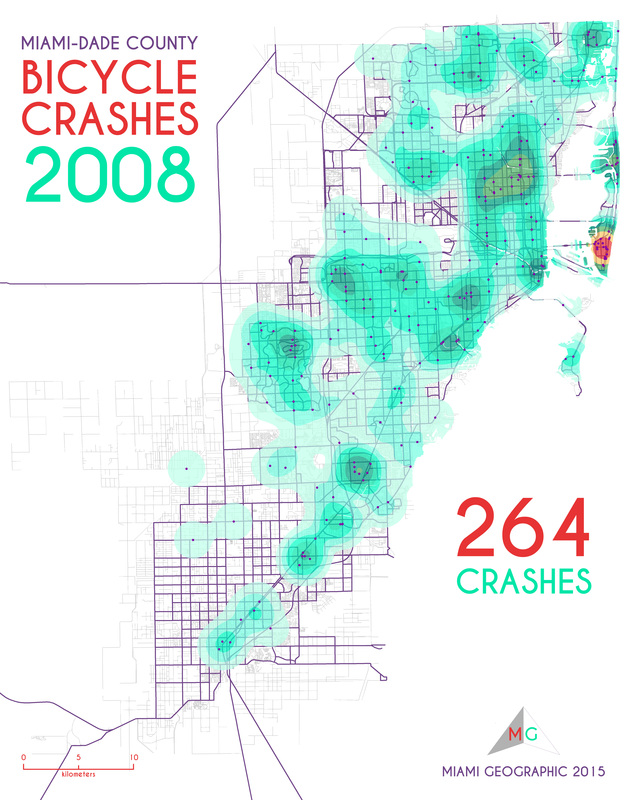 Miami-Dade Bicycle Crashes, Animated, 2005-2013. Data Source: FDOT Safety Office. Graph Source: Sebastien Lozano & Matthew Toro. 2015. We invite you to study the evolution of Miami-Dade County’s bicycle crashes for yourself. Feel free to share your own observations and hypotheses about these spatial patterns in the comments below! These bicycle crash heat maps were produced using a kernal density function — cell size = 15 meters; search radius = 3000 meters. This function calculates a ‘smoothed’ surface of density values based on the concentration of points throughout the area analyzed, in this case, Miami-Dade County, Florida. I love ride my bike from Princeton, Homestead to Homestead Downtown, and to South Miami. My sad experience is: when I’m crossing the street some older and younger people, don’t follow the traffic signs and don’t respect my turn to cross, even the traffic sign is showing the white hand. I’m feeling very nervous and confused. ¡What I have to do?. Really I had see near my own dead by bad drivers, five times. I would like to see a map of the most dangerous intersections, overlaid with their FDOT L.O.S. rating, number and width of lanes, and whether they are characterized by FDOT as dangerous or not. Thanks for reading, John Hopkins! We’re unaware of previous work focused on Miami-Dade’s bicycle crashes — please share any resources you know of; we’d love to know about what’s already been done! By ‘composite one’, we presume you mean a map of ALL crashes (2005-2013); we can most certainly do that! Follow-up posts will explore these data from different thematic perspectives, as well as at smaller geographic (larger cartographic) scales. Nice maps! I appreciate your update on the work David Henderson did some years ago. And I like the way you addressed the rise in reported bike crashes. For deciding where to deploy resources, though, wouldn’t it be useful to compare the newest map with a composite one?